Leigh Mesher was born in Kirkland, WA and started riding at the age of 5. She participated in 4-H and Pony Club with a pony named Plum and rode in her first three day event at the age of 11. She's been completely hooked since. - Started riding at 5 years old. - First pony at 9 years old. - In 2005, top 25th rider in the nation. 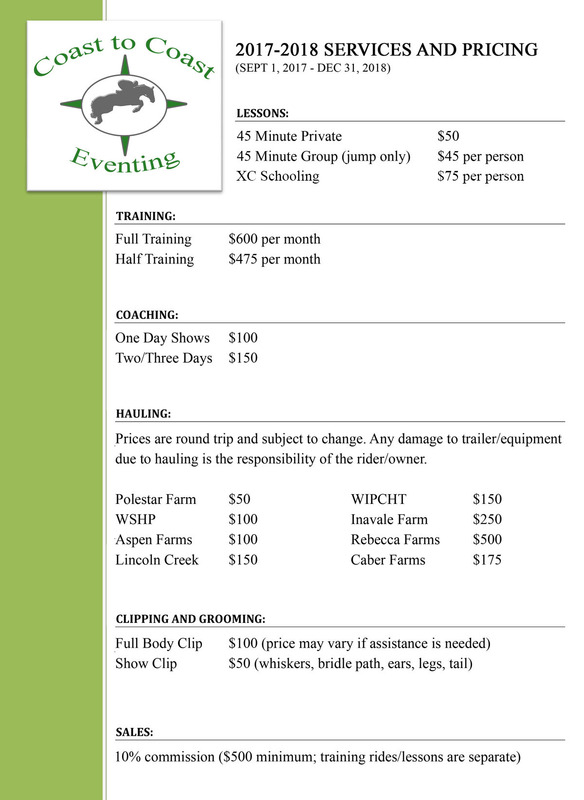 - Member of 4-H, Pony Club and Young Riders. - Owner of My Beau, 2002 WEG alternate and 2004 Olympic Games alternate. - Graduated from Seattle University in 2004 with a Degree in Journalism. - Since 1999, has traveled east to compete and train with top riders, including: Ian Stark, Phillip Dutton, David O'Connor, Amy Tryon and Buck Davidson. 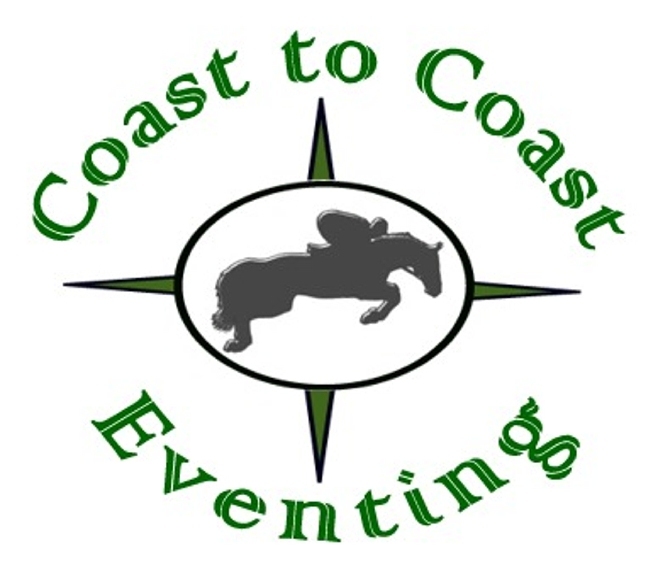 - After college, became owner/manager of Patterson Creek Equestrian Center and developer/trainer/instructor of Coast-To-Coast Eventing. - Trained horses, taught lessons and sold horses for more than 10 years. - Leigh took over the ride from her trainer, Amy Tryon, on My Beau in 2004. 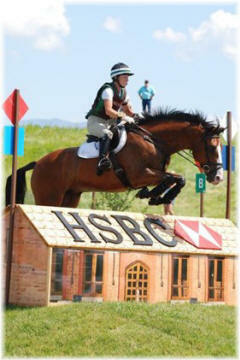 Soon after, she competed in her first Advanced horse trials at Twin Rivers placing second. In 2005, she went to the east coast for the fourth year in a row with Amy and competed in her first CCI*** at Fox Hall, placing 4th (above world class riders such as Phillip Dutton). Contact Leigh via email or at (425) 951-0155. Summer 2009: 1st place, Whidbey HT Advanced/Int. 2010 Dutch Warmblood gelding by Idocus. I bought him in the fall of 2014 and we had our first competitive season together in 2015. Fin just competed at his first CCI* at Rebecca Farm and finished in 9th place. 2001 SF Bay Gelding. Bred in France and imported to the states in 2001. He was originally a jumper, finishing 2005 as the five yr old of the year in California. I bought him from John Endicott at Indio that spring and started his career as a Three Day Eventer. He won all 4 of his Training Horse Trials and quickly moved up within one season to win 1st place in his first CIC*, CIC** and 2nd place at his first CCI**. Within 10 months he went from Training to Advanced level, placing 2nd, only behind the 2008 World Cup winner. In 2010, Dinero (affectionately known as D$) won the Galway Downs Advanced Horse Trials from start-to-finish by more than 10 points. He also finished 5th at the Bromont CCI***. In 2011, he won the Twin Rivers Spring CIC*** and traveled to the Netherlands to represent the USA Eventing Team at Boekelo. Dinero then went to the east coast where he was ridden and competed by Buck Davidson. In 2013, they finished in 9th place at The Rolex Kentucky CCI****, Dinero's first 4-star event. 2007 OTTB, grandson of Seattle Slew. Revi is a fabulous mover and shows endless potential as he continues to work and learn. Revi was competitive at the Novice level in 2012, moved up to Training level in 2013, and to Preliminary in 2014. At the end of the 2014 season he did his first CIC* at Woodside in CA. He continues to improve and impress me every day. 2003 Zangersheid chestnut Mare. I bought her as an unbroken 4 yr old from Okanagan Show Stables in Canada. In '09, she competed at Training placing 2nd at Rebecca Farms and winning the Young Riders Benefit Horse Trials. Raffy was the 2009 Area VII Training Champion, winning the championships on her dressage score of 23. She contested her first Preliminary at the beginning of 2010 finishing in 4th place. Raffy also won the OP at Aspen Farms, finishing on her Dressage score and won the Spring 2011 CIC* at Galway Downs, both ridden by Karen O'Neal. In 2013 with Leigh in the irons, Raffy won the Zeit Capital Training Challenge at Aspen Farms. The division had 32 competitors and the pair finished on their winning dressage score of 25. 1990 Canadian TB Bay Gelding. Now retired from International Eventing. Beau's had a dream career. I bought him as a 9 year old for 1998 Young Riders. When I went to College in 1999, Amy Tryon took over the ride on him and competed him all over the world, including Fair Hill, Rolex Kentucky, Burghley, and Badminton. Beau was Amy's alternate horse in both 2002 and 2004 for the U.S. Team. He was my first Advanced ride, placing 2nd in a large field of riders and taking me to my first CCI*** at Fox Hall finishing 4th. He's taught many riders the gift of correct use of aids and has been loved and cared for by many grooms, students, and trainers. 1999 Cdn TB Dark Bay Mare. I bought this elegant mare in Canada as a hopeful eventer. Unfortunately due to a couple injuries, she was unable to move forward with her competitive career. Her bloodlines however, being the daughter of Traveling Victor, (a very well known and winning race horse in Canada) showed off in her amazing gaits and scope. She was bred to the stallion Chopin, a WB from Okanagan Show Jumping Stables, and foaled a beautiful filly named Czarina. We hope she will be a force to be reckoned with in years to come. Twiggy had a new baby in March 2012! She was bred to Quinar (1995 Holsteiner), who stands at Fox Fire Farm. Astranomical is an 8 year old mare that I rescued from the Zillah Feed Lot in 2013. She is currently eventing at Training level. Quiet, easy and excited for her future! Indyana Jones is a 5 year old gelding that I rescued from the Zillah Feed Lot in 2013. He is schooling 2'6" with way more potential which will make him a great future event horse. Excited to see what the future holds for this very athletic guy! Peanut is a mini mare that I rescued from the Zillah Feed Lot in 2014. She was dropped off with a large group of mini's and was about to be left behind before I heard she needed a home. She is a very sweet little girl and a great partner for My Beau in his retirement.